Granola. Doesn’t it just scream fall? I love every kind, especially the pumpkin and spice varieties. Although I’ve never made a pumpkin granola myself, I thought sweet potato would be a fun experiment and an exciting route to take. And so I did (quite successfully, I might add). This recipe begins with all things hearty and good: Nuts and oats. I opted for almonds, pecans, and pepitas, but you could really go with any nut or seed of your choice. Just make sure they’re untoasted lest they’ll burn in le oven. 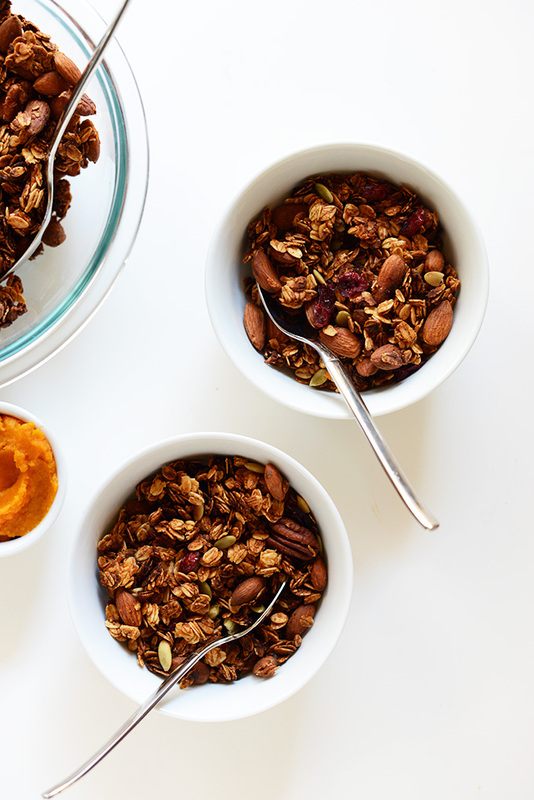 This granola gets its gorgeous hue (in part) from sweet potato puree. 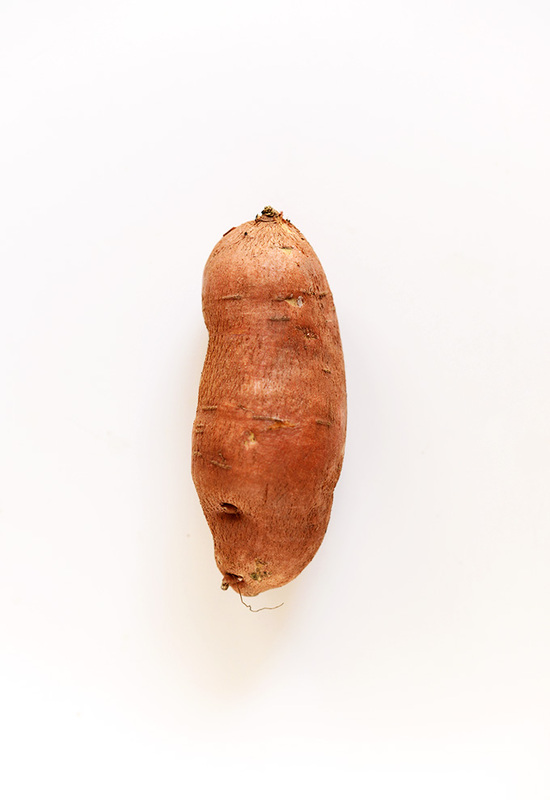 Just bake up a sweet potato, puree a generous portion of its tender filling, and add it right into the wet ingredients. Slather the remaining portion with almond butter and shovel it directly into your face. Win win. 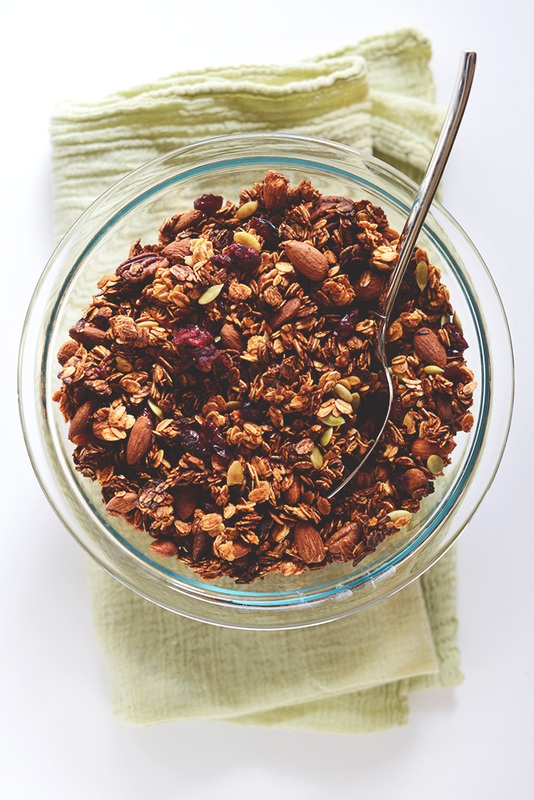 Sweet potato not only provides a slight sweetness and orange hue to this granola, it also provides a ton of health benefits. Sweet potatoes are rich in vitamin B6 (prevents heart attacks), vitamin C (wards off sickness), and vitamin D (boosts immune system), as well magnesium, which can help relieve stress. They also provide ample amounts of carotenoids – an antioxidants that helps fight cancer-causing free radicals in the body and even improve eyesight and immunity. Sweet potatoes are also high in fiber, iron, and potassium. The benefits are practically endless. I can imagine it would be equally delicious with pumpkin instead of sweet potato as well. I guess I’ll just have to try another batch to test out that hypothesis. Shucks. I’m in love with this granola. It’s super crunchy and hearty and perfectly sweet and spicy from the cinnamon. Much to John’s pleasure, the sweet potatoes are not the dominant flavor, but rather another layer of flavor and sweetness. The nuts give plenty of staying power, the cranberries a little tart sweetness, and the oats tons of fiber. Health in a bowl, I say. I’ve been enjoying mine with almond milk or sprinkled on top of yogurt or a bowl of steel-cut oats. I’d imagine it’s also lovely on top of smoothies or straight outta the bag. It’s simply the perfect fall food with its heartiness and spice. I can easily see it becoming a staple in our house in the chillier months to come. Though I’m not usually a fan of cold weather, if it involves lots of sweet potato granola I think I can get in the mood. Cheers! 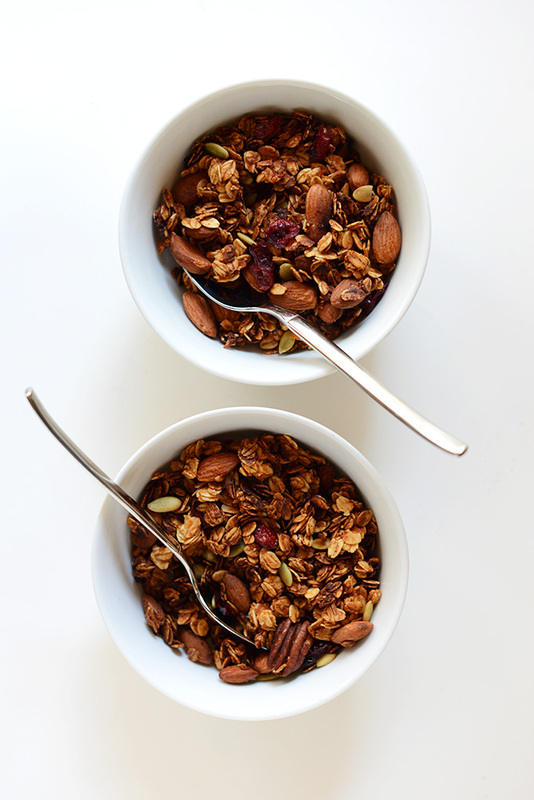 Simple sweet potato granola with oats, nuts, pepitas, and cranberries. Crunchy, sweet, and satisfying. Perfect over oatmeal, yogurt, or smoothies or swimming in a bowl of almond milk. 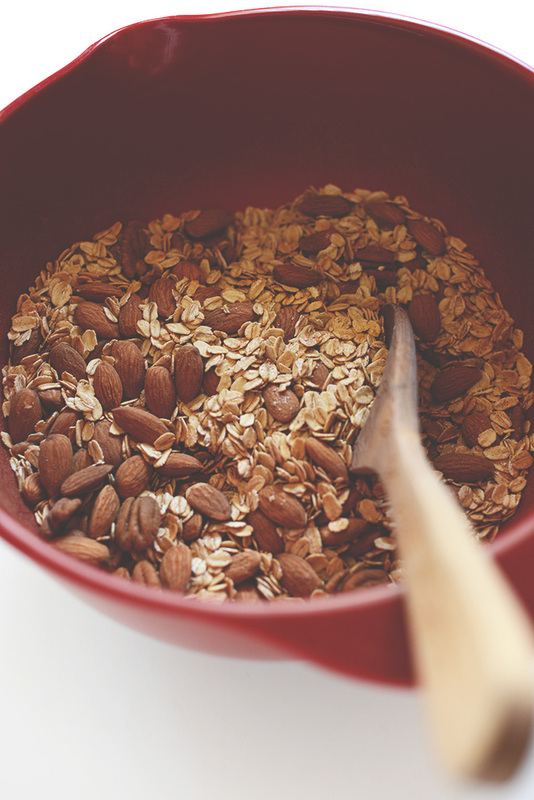 Mix the oats, nuts, cinnamon, sugar,, and salt together in a large bowl. 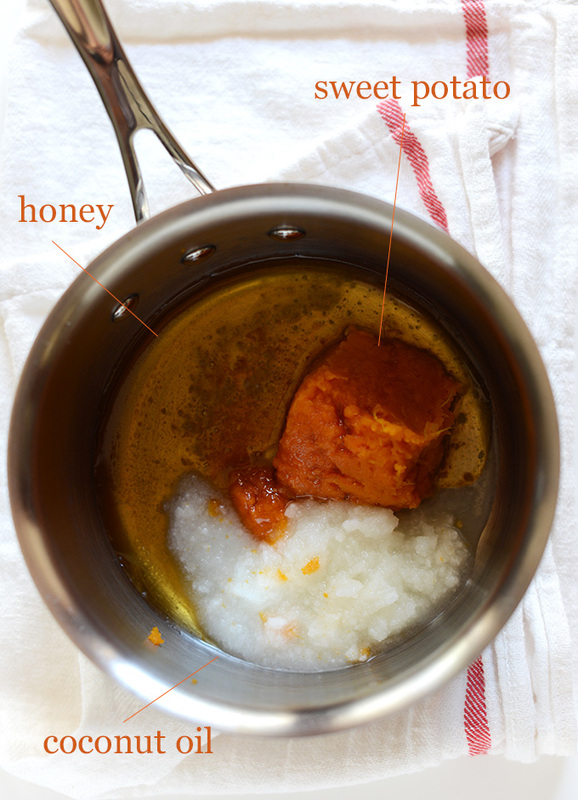 In a small saucepan over medium-low heat, warm the coconut oil, honey (or maple syrup) and sweet potato puree and whisk. Pour over the dry ingredients and mix well with a large wooden spoon. Spread the mixture evenly onto two baking sheets (or bake in two batches // use more baking sheets, as needed, if increasing batch size) and bake for 20-25 minutes, stirring a bit near the halfway point. If you like a chunkier granola, don’t stir as it breaks up the clusters. Instead, just rotate the pans at the halfway point to ensure even cooking. Add the craisins or other dried fruits, and any toasted nuts to the baking sheet in the last 5-10 minutes of cooking so they don’t get too toasty. Once the granola is visibly beginning to brown (usually 20 minutes), remove from the oven, and let cool completely. Transfer to an airtight container. Should keep for a couple weeks. *If your nuts are already toasted, simply add them in in the last 10-12 minutes of baking and lightly toss to coat. Otherwise, they’ll get too brown by the end of baking. I am unable to eat granola because I am recovering from jaw surgery BUT I love food so much that I just wanted to be around it so I made this for my family. The whole batch was gone in 2 days. My brother said, “This is the best granola I’ve ever had.” I smelled it, I know he was not lying. It is also so BEAUTIFUL!! I ended up using 2 cups of oats and 1 cup of buckwheat. I put dried blueberries and cranberries in this batch and I suggest baking the buckwheat and dried fruit together in some of the delicious sweet coating separately because they tend to cook faster. Wow, just when I thought your granola recipes couldn’t get any better! The aroma from the cinnamon and honey is divine, and I can’t wait til morning to have a bowl! I just finished making my second batch of this delicious granola. It has become my family’s go to snack- including my 2 & 3 year old! I used almonds, pepitas, sunflower seeds and pecans this time around and enjoying the “crunch” they add. I especially love the spicy fall aroma that fills are home while it’s baking. Yay! Glad to hear it, Hillary! With the addition of sweet potato, I was skeptical about whether this granola would come out crunchy. Though it came out of the oven a bit tender, the granola “crisped” while cooling. This is light and subtly sweet with a hint of cinnamon spice. Delicious! This will likely replace my old granola recipe, which has much more sugar and fat. I made this recipe with pumpkin instead of sweet potatoes (which I didn’t have on hand). Overall it turned out great! I would suggest watching closely after the 20min mark, as I almost burned my second batch. Thanks for the recipe! I made this granola last week to take with myself to hospital (we are expecting a baby very soon), i put 2 sweet potatoes in it as I love the taste, but the baby hasn’t decided to come yet, how long can i store it out of fridge in a plastic container ? Love love love this granola! I’m glad I found your blog, Dana and thanks for the great tips and recipes. I’m now baking granola and moving on to the chocolate pudding cake for my hubbys birthday cake. ?? I ended up making this recipe using leftover butternut squash puree, and WOW! Delicious granola! Very crunchy and fantastic flavour! Just made this and added toasted quinoa for fun. It is delicious – you can’t even tell the sweet potato is there. And it was splendid on some plain yogurt. Question! I just pulled mine out of the oven. Should it come out crispy or does it harden once cooled? omg im in love.just made two batches! I have been making so many of your granola recipes lately. I can’t get enough! Dug this one up at the perfect time as I had some sweet potato mash leftovers in the fridge that needed a use! Can’t wait to enjoy with yogurt tomorrow morning. A question: I have everything except coconut oil. Is it absolutely necessary for this recipe to work? Is there something else I could substitute? Thanks! You can sub another oil, such as olive, grape seed or canola! I made this with only 1 tbsp sugar, just 1/4 cup maple syrup and grapeseed oil and it turned out great. Dana, you have really cracked the code when it comes to granola by using fruit/veggie puree to add moisture and depth of flavour. I made this granola and it turned out great! I’ve had it for breakfast with greek yogurt, honey, and blueberries for the 2nd time this week. I had family over and they also loved it. thanks so much for the great recipe. Made it. Loved it. Can’t stop eating it. My family and I all agree that this is my best batch of granola yet. So addicting! My favorite part about granola is that it’s a delicious topping to absolutely anything or just on its own. Thanks for your neverending array of flawless recipes (and photos)! So glad you’re all enjoying this, Robin! Thanks for the kind words and for sharing your experience. I made your banana bread granola last week (which I had this morning and every morning since making it) and now I think this is the next granola on the roster! LOVE IT! I think I should point out a serious error in the recipe. You suggest it lasts two weeks, I have made this four or five times now and on not one occasion has it lasted two weeks…all eaten in two days! Thank you for this amazing addition to our breakfast! This sounds really good! I’ll have to try this one for my vegan son. They look so amazing and the color is so so yummy.I m gonna make on this Big fat Xmas!!!! Just recently discovered your blog and tried this recipe today–absolutely LOVE it!!! That top picture is seriously woah. 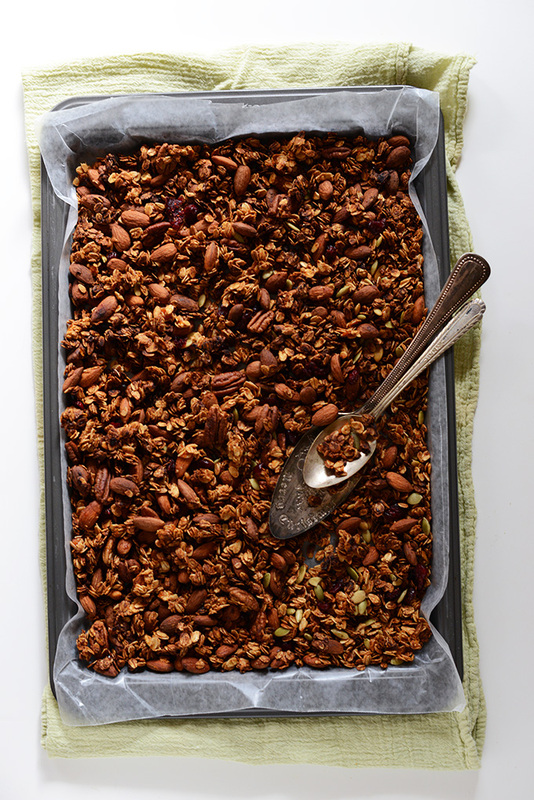 I am baking this granola right now. I used coconut oil, coconut nectar and pure maple extract as the sweetener. I also roasted the sweet potatoes to bring out their sweetness. I used raw almonds, pecans, walnuts, crystalized ginger, flax seeds, hemp seeds, cacoa nibs, and raisins. It smells wonderful. Thanks for posting this recipe. YUM! And gorgeous pics. I shared this recipe on my blog. Just want you to know that of the last five recipes I googled your recipes were the clear winners. Beet hummus and sweet potato granola were both huge hits with my very picky, foody, gay, NYC hiking group. Food for thought: for a change, replace the beets with roasted sweet potato for the hummus and you’ve got something amazing! Totally totally love the idea of the sweet potato in this. 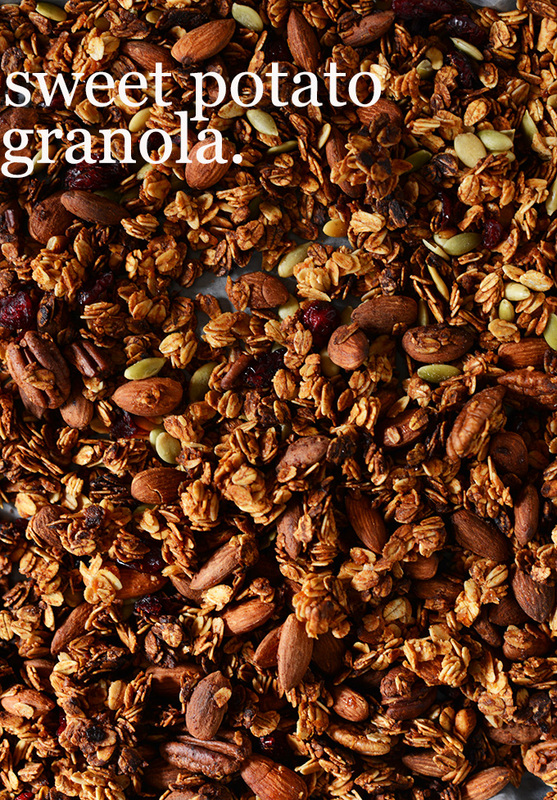 High five for some tasty looking granola! OH MY GODDD this is perfect I’m literally gonna make a batch per week, I’m in love with this recipe. Oh how I love this idea, Dana. 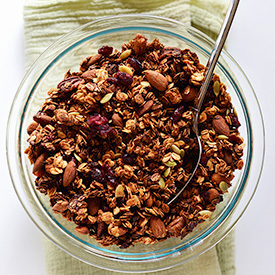 What a great trick for adding some extra nutrients, and makes for such a lovely color on that granola! Yum! Whoa and whoa. I just made a batch of these and they are so so so good. Thank you for the recipe! Followed it exactly, threw in some ground flaxseed as well. I can’t stop munching on them. Huh! I’ve seen a bazillion granola recipes, but NEVER one with sweet potato. I’m super curious to see how it impacts the texture of the oats, so will definitely be giving it a try. Marygrace I thought it might make them mushy but it doesn’t at all! One of the best, most crispy granolas I’ve tried. Hope you give it a shot! Brilliant! I wouldn’t have thought of adding sweet potato puree to granola, as I’d think it might make things weird and clumpy. But since it worked for you, I just may have to try it! Love, love love this! Such a good idea/alternative to pumpkin. What a nice way to incorporate pumpkin. 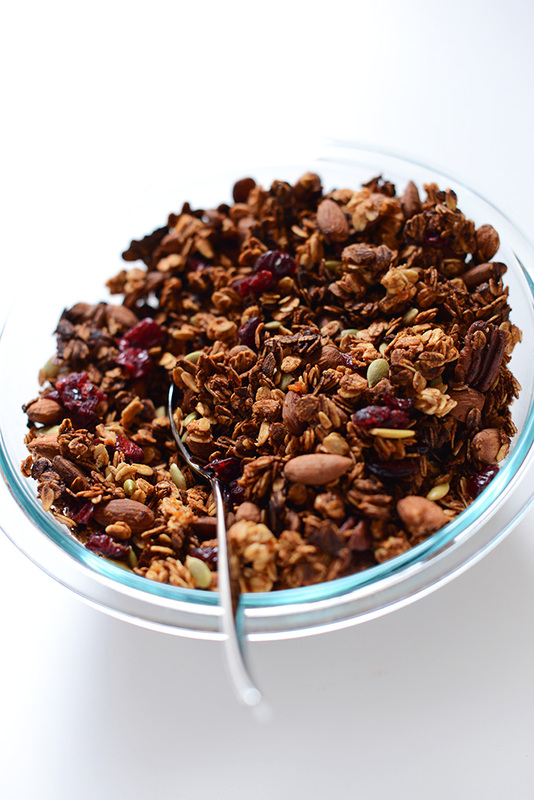 A nice granola recipe, thanks for sharing. HOLLA for sweet potatoes! I just made some vegan sweet potato doughnuts – I might eat this for breakfast for the next week, while I work off the doughnuts. Love the flavors and colors here! im a granola-nut.thanks for the new recipe. I have a open can of pumpkin will subs sweet p’s soon. Pumpkin would probably work, too, in lieu of sweet potato, don’t you think? So many good things in one bowl, love it. all of my favorite foods in one recipe… i need to try this very soon! 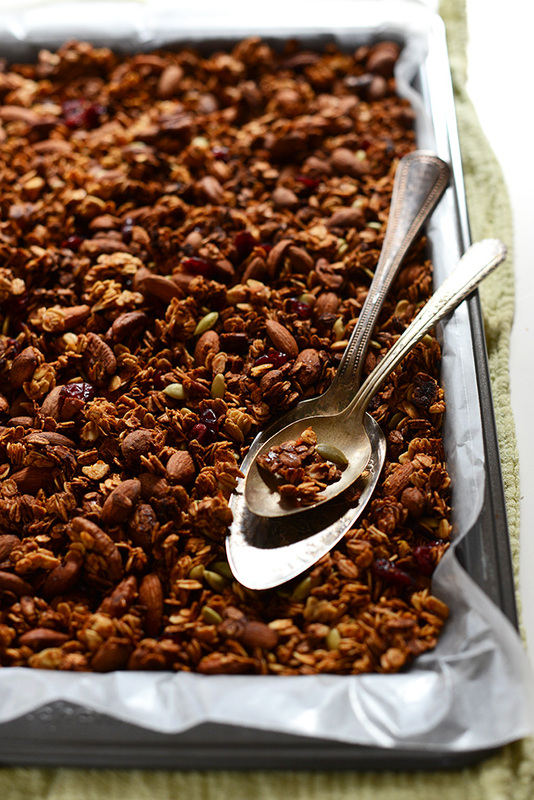 ahhh… I could go for a big bowl of this granola right now. <3 I love all the gorgeous nuts and the simplicity of this recipe! Love it! 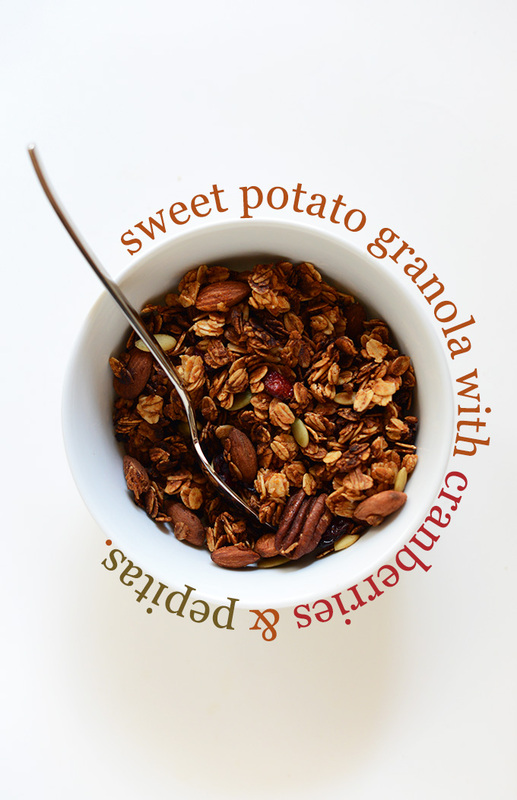 Fall does scream granola and sweet potatoes, so this is perfect! I wondered whether sweet potato would work as well as pumpkin…now I know! Yum. That’s exactly why I tried this recipe. It totally works! Could Agave be used in place of the honey? I am excited to try this recipe! I just love teh taste of sweet popato and I can imagine how good it must be blend in the granola! Big fan of sweet potatoes over here! We just pulled a crazy big load of sweet potatoes from the garden….guess I know what I’m making!